Several years ago when we were just beginning to fall in love with the mountain valley where we now live, we rented a house and spent the Christmas holidays there. With us on that visit were my daughter who was pregnant with her first child and my son and his young family. I had bronchitis which limited the time I could share with my family. 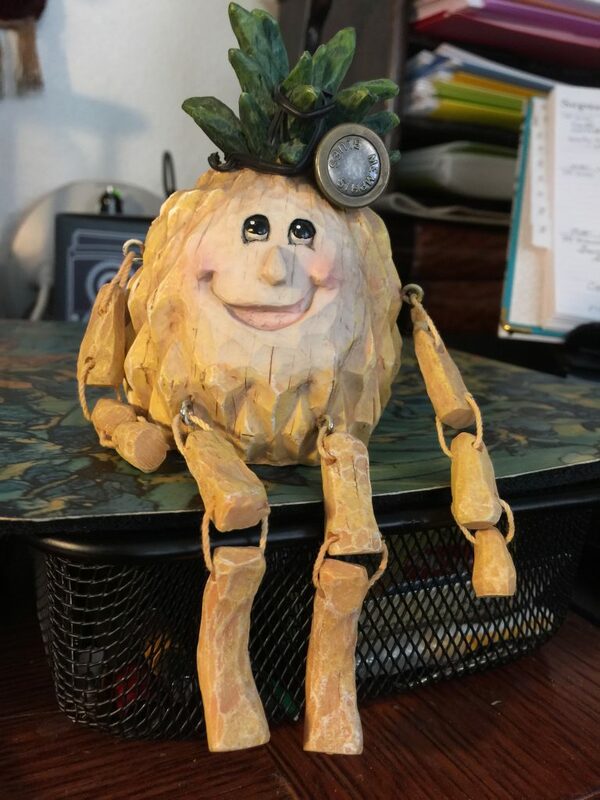 To cheer me up, my husband brought me the comical pineapple man above with his cheerful face and floppy arms and legs. He sits on my writing desk to this day and reminds me of that Christmas, of the wonderful view of the mountains, of the rare pleasure of having my family together. 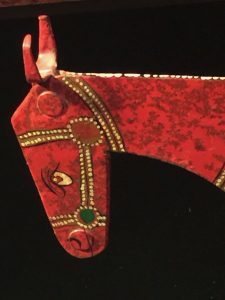 There are other pieces like the red metal mule we found at an estate sale and that serves as the model for the Red Mule Publishing logo. I can still remember the fun day my husband and I had, the crowded house filled with treasures from another’s lifetime, and my cautious delight when I found my mascot. There’s the pink teddy bear from my oldest granddaughter. I’m not sure but I think she won the bear from one of those machines where you try to pick up the stuffed animals. The painting of a fox from my other granddaughter was a Christmas gift, the Beanie Baby from my older brother a souvenir of our trip together to see our mother. The small prickly hedgehog reminds me of my mother’s courageous handling of her final days. The small porcelain box from my other brother not only brings him to mind, but pulls up my memory of him during a special time in his life. A silver St. Nicholas snow globe from my sister is never packed away with the other Christmas decorations but sits near my bed year round. When a person is in the midst of an event, it seems as if the feelings, the knowledge gained, the mistakes avoided or committed will be sharp and clear forever. But events fade from mind. Friends and family members disappear from our lives. Too much happens in a life to remember each moment. So thank goodness for the memory placeholders, those objects that remind us of some special person or special event and repeatedly engage our memories and enrich our lives as we go forward.